Lynn LeTourneau showing in two venues! Thurs-Sun noon -6, Fri and Sat. noon-9. Come by and check out the great art! Leslie Plimptons work on display! "Please join me for the next big opening reception at the CSUCI Gallery at the cornerof Main & California this Thursday from 6-9pm. I will be showing work in the gallery.This party sounds like a blast: The title is "Summertime Blues" with southern comfortfood by Southern Chic Catering, featuring live music by the "Tony Randall Experience. "See the latest newsletter for info....hope you can come!" 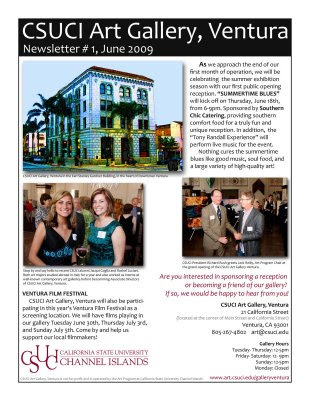 If you are in Ventura, come and join the fun.